Home ¬ How to ¬ Resolve Exchange 2010 Error that is Unable to Mount Database? If you are facing the issue 'unable to mount the database' in any version of Exchange Server like 2010, 2013, and 2013, then it is essential to learn the role of transaction logs. A transaction log is the life-and-blood for an Exchange Server, helping it retain smooth functioning on the server. Every transaction made to the server is being written in these log files, which are then committed to the database. Until the transaction is not saved in the database, it remains the system memory and the transaction logs. If any crash occurs during this event, then you lose the content from memory during the reboot, because it was not completely saved on to the exchange database files. This is why transaction logs are the robust recovery mechanism to safely restore the data to an Exchange database in a consistent state. The get the following error message when you are unable to mount the database back to Exchange Server. Deletion of transaction logs, which were pending to be committed in database. Microsoft has provided Eseutil utility to verify whether or not the database is in a clean shutdown state. If isn't in a clean shutdown state, then this inbuilt utility may help you to fix up the issues and bring the database into consistency. And if the data is inconsistent state, then using the below-mentioned resolution, you can restore the information successfully from the backup. Removal of the log file is one of the common reasons, due to which the database may fail to mount. To resolve the issues, it is essential first to perform a consistency check. If the output displays the database in a dirty shutdown state as shown below, then the database is missing a transaction log. When the repairing process gets complete, then again perform this action: Run eseutil /mh command. Doing so will let you verify that the database is in a clean shut down state or not. However, if you are still unable to mount the database, then verify the consistency of transaction logs. However, if you are still unable to mount the database, then try using a reliable third-party Exchange Server Recovery tool to efficiently restore data in any condition of damage - even where Eseutil tool fails to deliver the desired result. 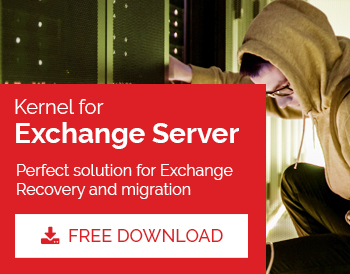 Kernel for Exchange Server is an advanced recovery tool to repair corrupt Exchange database files, without requiring log files or Exchange services. EDB to PST converter tool even allows you to restore EDB files directly to live Exchange Server and to Office 365 mailbox.